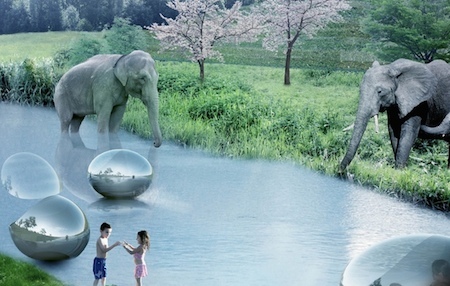 A cage-free version of the Givskud Zoo in central Denmark has been created by the Danish architecture firm BIG (Bjarke Ingels Group). “Architects’ greatest and most important task is to design man-made ecosystems—to ensure that our cities and buildings suit the way we want to live,” the company said of the project in a statement. The 300-acre complex will be divided into open range sections for Asian, African, and American ecosystems. Visitors will be able to survey the giant paddocks from a high perimeter wall, or can take in the sights by bike, boat, truck, or even cable car. There will also be a four mile hiking trail that borders each of the three main ranges. The redesign will probably not be implemented until 2019. From Bjarke Ingels Group via Vice.